Between the War of 1812 and the Civil War, the federal government largely retreated from a program of national economic development, while the states stepped into the role of economic promotion, particularly in the banking and internal improvement fields. The Jacksonian Democrats dominated American national politics in the decades before the Civil War, and opposed federal promotion of economic development. Congress enacted tariffs in 1816 and 1824 that provided modest protection to American manufacturers from foreign producers. These acts were justified on the basis of Congress’ power to raise revenue, to regulate commerce with foreign nations, and to develop American industry as part of national defense. American consumers had to pay higher prices to benefit domestic producers and often objected to the tariff. In 1828 Congress enacted an extremely high protective tariff that was soon attacked, especially in the South and West, as the “Tariff of Abominations.” This caused Vice President John C. Calhoun, formerly an ardent National Republican, to resign and lead South Carolina’s opposition to the act. Calhoun, and Democrats from much of the rest of the century, believed that the Constitution permitted Congress to tax imports “for revenue only,” not to benefit domestic manufacturers in some areas (the urban Northeast) at the expense of consumers in others (the agrarian South and West). 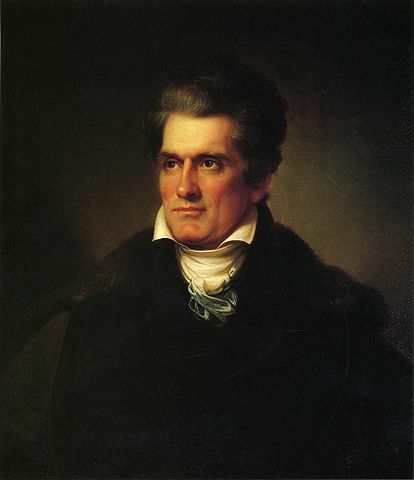 Calhoun concocted a new theory by which states could “nullify” acts of Congress that any of them thought to be unconstitutional. The other states would have to amend the Constitution to give Congress the disputed power, in which case the nullifying state could secede from the Union as a last resort. Though he favored states rights and a lower tariff, President Andrew Jackson denounced nullification as treason, and Congress strengthened his power to use force to put down nullification. In the midst of this crisis Henry Clay, Senator from Kentucky and leader of the incipient Whig party opposed to Jackson, brokered a compromise in which Congress gradually lowered the tariff, and South Carolina rescinded its nullification. By 1846 the U.S. had become a virtually free-trade nation. Calhoun concocted a new theory by which states could “nullify” acts of Congress that any of them thought to be unconstitutional. Finally, in 1840 Congress established an independent treasury, keeping federal funds locked in its own vaults, removing the government completely from the banking business. In these years the U.S. had no uniform national currency. Its money consisted of gold and silver coin, some Treasury notes, and a variety of state bank notes. The federal government also withdrew from the “internal improvements” of roads and canals. President James Madison’s last act in 1817 was to veto John C. Calhoun’s “bonus bill,” which would have used the bonus paid for the second Bank of the United States (some $2 million) as a fund for internal improvements. Some Democrats believed that Congress could subsidize, but not itself build or operate, roads, canals, and the like. President Jackson held that internal improvement disbursements must be for genuinely national purposes, and vetoed appropriations that did not meet this criterion. In 1836 Congress simply apportioned its budget surplus among the states for them to use. By the 1840s the Democrats opposed all federal involvement in internal improvements, until the movement for interstate and even transcontinental railroads in the 1850s revived the issue. Some Democrats believed that Congress could subsidize, but not itself build or operate, roads, canals, and the like. The federal judiciary was especially important in facilitating economic exchange throughout the nineteenth century, primarily by protecting individual property rights against state interference. Congress did not do much under its power “to regulate commerce among the states,” but the federal courts used the Constitutional clause to prevent state interference with interstate commerce—to stop state efforts, prevalent before the Constitution, to protect state businesses from “foreign” competition and thus inhibit a national market. 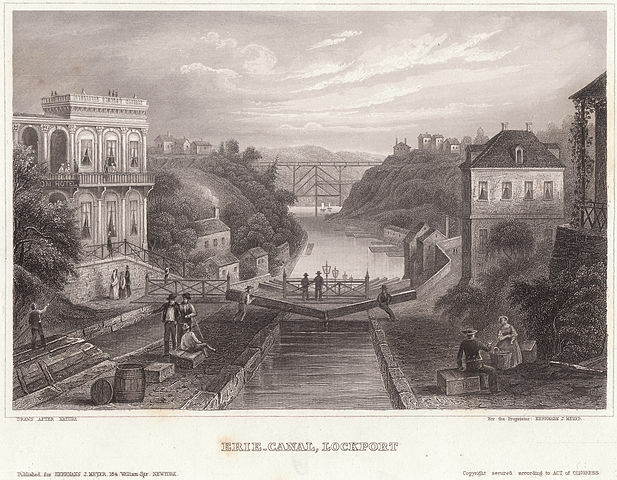 New York, for example, granted a monopoly to Robert Fulton to operate steamboats across the Hudson River. The Supreme Court overturned this grant in Gibbons v. Ogden (1824), technically because it conflicted with an act of Congress regulating the costal trade. But even in the absence of explicit congressional acts the Court often struck down state laws affecting interstate commerce. The Court’s basic principle was that if Congress had not acted to regulate interstate commerce, it should remain unhindered by the states (known as the “dormant commerce power”). Thus it held that states could not impose taxes on wholesale goods from other states. At the same time, the Court recognized that legitimate exercises of the state “police power” (the power to legislate for the public safety, health, welfare, and morals) might have an incidental effect on interstate commerce. For example, draining a malarial swamp might impede a navigable waterway. The Court devised no hard-and-fast rule to define the commerce and police powers but judged whether matters were national or local on a case-by-case basis. The Contract Clause of the Constitution was the most important judicial means to protect individual rights. While the Bill of Rights was understood to limit only the national government, the Contract Clause amounted to “a bill of rights for the people of every state,” Chief Justice Marshall said. In addition to the protection that it afforded to corporations, the Clause prevented the kind of debtor-relief laws that plagued the economy under the Articles of Confederation. State interference in contractual rights tended to “destroy the confidence of man in man,” he said, on which a free economy depended. Developing nations need above all a system of contract and property rights, and in the nineteenth century the U.S. was a developing nation. Individuals were no longer defined by status—by birth, class, or race—but were equal persons before the law. Defined by the ability to make a voluntary contract, individuals were equal and democratic. The federal courts also extended their own jurisdiction for the sake of economic freedom. The Supreme Court widened the old definition of “admiralty and maritime” jurisdiction from tidal to all navigable waterways. It recognized that corporations were “citizens” with access to federal courts and many, if not all, of the constitutional rights of natural persons. It also developed a federal common law for suits between citizens of different states, which protected the rights of out-of-state corporations. And the common law—the set of legal principles developed by judges in particular cases in the absence of legislative acts—in both federal and state courts developed along with the economy. Judges adapted legal principles concerning property, contracts, and torts to encourage new enterprises but also to ensure that they did not unjustly harm established or vulnerable interests. By the mid-nineteenth century the U.S. economy had reached the point where it could rival the most prosperous and powerful nations of the world. But the nation had to survive a critical civil war in order to maintain that status. And the war and its aftermath introduced important changes to its political economy.